"I take passenger, I look at gas. I take another passenger, I look at gas," said one taxi driver. "Tension all the time." 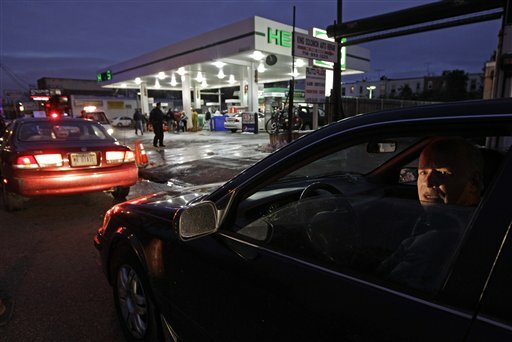 NEW YORK — A gasoline shortage caused by Superstorm Sandy forced 1970s-era rationing on New Yorkers Friday, adding a fuel-gauge obsession to their frayed nerves and dwindling patience. Though rationing that allowed private motorists to fill up only every other day seemed to help with gas lines, it didn’t answer motorists’ questions about why they had been waiting for days in hourslong lines to fuel up. The confusion led some, like Angel Ventura, to panic. Ventura, who drives a delivery van for a camera rental company, has taken to hunting for gasoline every time his gauge drops below a quarter of a tank. “It makes me crazy, thinking I might hit empty and not be able to find it,” he said. As drivers waited on police-monitored lines, thousands more in the region got their power back for the first time since Sandy came ashore 12 days ago. Nearly 400,000 customers were still without power in New Jersey and the New York City area. President Barack Obama, who visited the battered Jersey coast two days after the storm, said he would survey the damage in New York next week from the storm, which the American Red Cross said will create its largest U.S. relief effort since Hurricane Katrina in 2005. The gasoline rationing — the first in the nation’s largest city since the 1970s Arab oil embargo — forced motorists to line up depending on whether their license plate ends with odd or even numbers. Mayor Michael Bloomberg said one-third of the city’s gas stations were open Friday, compared to 25 percent the day before, and cautioned, “there’s no guarantee that odd-even is going to make a big difference.” His estimate was countered by the Energy Department, which said that more than 70 percent of the city’s stations have gas available for sales. Industry officials first blamed the shortage on gas stations that lost power, but now say the problem has shifted to supply terminals, which are either shut or operating at reduced capacity. Drivers are also quicker to top off tanks because they’re afraid gasoline won’t be available, AAA spokesman Michael Green said. Tom Kloza, chief oil analyst at the Oil Price Information Service, said the densely populated New York-New Jersey area has fewer stations per capita than any other major metropolitan area, making the shortage an even bigger problem. He said rationing earlier might have helped in New York City. “It does curb some of the manic or panic behavior,” Kloza said. Gasoline moves millions of New Yorkers, just as the subway does. Hundreds of thousands of people drive to work, especially from the outer boroughs, and taxis and delivery vans are part of every gridlocked intersection. Friday was an “odd” day in the rationing plan, although not everyone had gotten with the program. “Even? Odd? Whatever it is, I didn’t have the right one,” said Joe Standart, a 62-year-old artist whose even-numbered car was ordered off a West Side gas station line by a police officer. Teniele Newbury, a mother of three, defended her need to use a car to go about her daily routine. On Long Island, where odd-even rationing also began Friday, a spot check found shorter lines — 30 to 40 cars at most — and more stations with gas. In Brooklyn, car service owner Gary Lindenbaum said waits last week had been five or six hours. Some cab drivers have been doing just that. One taxi reeked of gasoline from the extra cans sloshing around in the back seat with a passenger. Desperate drivers weren’t paying much attention to prices, but in New Jersey, seven gas stations were among the eight businesses sued by the state Friday on price-gouging claims. Meanwhile, many officials were pointing to power companies as the culprit in the region’s slow recovery. Gov. Andrew Cuomo has called for investigation of the region’s utilities, criticizing them as unprepared and badly managed. On Friday, two congressmen from Long Island urged the federal government — even the military — to come in and help the Long Island Power Authority restore electricity. Long Island’s main utility, the Long Island Power Authority, has declined to respond to criticism, while New York utility Consolidated Edison Corp. has called the storm the worst in its history. On Friday evening, National Grid, which manages the system on LIPA’s behalf, said about 95 percent of customers affected by the storm would have power restored by the end of Tuesday. It said those 95 percent are in non-flood areas. Obama said Friday that he will meet with affected residents and first responders in a tour of the hardest-hit areas of the city. Some residents of Toms River, N.J., were given a precious hour Friday to see their storm-wrecked houses for the first time and grab warm-weather clothing, important pictures — whatever belongings they could. When Steve Dabern saw his flooded house, the floor was torn in pieces, the refrigerator was on its side and the kitchen furniture was in the living room. “Sickness. I felt sick,” he said. 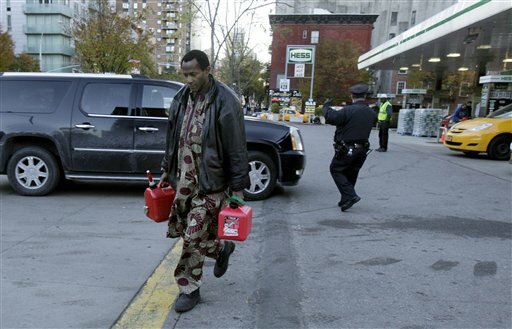 Bloomberg said the gas shortages could last for a couple of weeks, worrying many New Yorkers who say gas is vital to their lives. At St. Mary’s Children’s Hospital in Queens, workers who visit 4,000 sick children have been getting up as early as 2 a.m. to get on gas lines, said chief administrative officer Hope Mavaro Iliceto. Some have run out of fuel while waiting in line, she said. At the Brooklyn gas station, Ruben Quinonez and Edgar Luna were in the delivery truck they drive for a bakery in Mahopac, north of the city. They normally work from 10 p.m. to 6 a.m., making deliveries in Brooklyn and Manhattan, but every day since the storm they have added a long wait in a gas line.